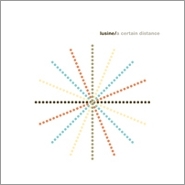 Why not start listening to Lusine‘s new album, A Certain Distance, at the end — the closing track, as it happens, is the one made available for free download by its estimable label, Ghostly, whose generosity was recently cemented with its free iPhone “discovery” app (see ghostly.com/discovery). That iPhone app allows users to stream the entire Ghostly catalog, as filtered by mood, tempo, and the relative space along a continuum from digital to analog. By those measures, the coordinates for “Cirrus,” the Lusine song in question, would be something like: an introspective mood, a relatively upbeat tempo, and about 90 percent digital, allowing for some computer-etched vocal elements toward the end. It’s a blippy bit of electronic instrumental pop, sounding a bit like one of David Byrne and Brian Eno’s recent collaborations, except that a lead vocal line never arrives. It’s a brittle but vibrant brand of antiseptic electronica, and pretty darn addictive. More on the release at theghostlystore.com. Visit Lusine (aka Jeff McIlwain) at lusineweb.com. Amazing track! I’ve grown quite fond of it. Glad you dig it. Often melodies get overshadowed by concept here, and something like this Luisine definitely leaven the headiness.